Thank you for visiting Honda of Fort Worth! As a leading Fort Worth Honda dealer,we have built a solid reputation for providing excellent customer service,competitive prices and efficient service. We are a full-service dealer that offers new and used Honda car sales, as well as maintenance and collision services. Our friendly and experienced sales staff is here to help you six days a week with any of your automotive needs. At Honda of Fort Worth, our customers are our family, that's why you'll always find an honest and hassle-free experience every time you come in. At Honda of Fort Worth, we pride ourselves on being leaders in our community. We work with many organizations around the Dallas-Fort Worth area, including Fort Worth's world-famous Mayfest! We also strive to provide our customers with a warm and welcoming atmosphere, which is why you'll find many customer-focused features at our Fort Worth Honda dealership. Stop into our Twin Creeks Cafe for lunch while you're waiting for your car to be serviced or drop your kids off at our play area. While you're here be sure to take advantage of our complimentary car wash, as well as our free shuttle service and dog park. 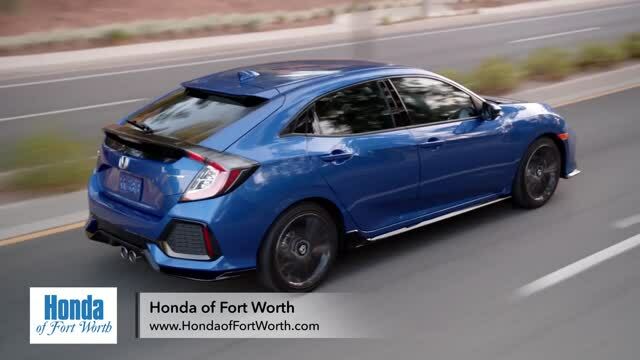 If you're in the market for a new or used Honda car for sale in Fort Worth, you'll discover our wide and varied selection boasts some of the most popular models on the road today. Our stock of new Honda cars features family favorites, such as the Honda Accord and the Honda Pilot, while our used car stock features many various models from other top automakers. Speak with one of our knowledgeable staff members about our terrific new car specials and Honda financing options on new Honda cars for sale in Fort Worth. Also, be sure to ask about our certified pre-owned stock that offers confidence and peace of mind on your next used Honda car. You'll find quality car repair in Fort Worth at our state-of-the-art service center. Our service technicians are factory-trained to handle any service or repair job, from a routine oil change (your first one is free!) to full body detailing. Also, be sure to check out our parts department, where you will find a wide selection of OEM-certified Honda parts. Honda of Fort Worth is centrally located next to W Loop 820 South and Camp Bowie W Blvd. It has been our privilege to serve our community as a leading Fort Worth Honda dealer. Contact us today to schedule a test drive or for more information about our impressive stock of new and used cars! We are close to Weatherford, Parker County & Walsh Ranch.